The Canvio Basics portable hard drive allows you to collect your content and take it anywhere, offering high storage capacity, 24/7 accessibility to your stored content, and time-tested reliable performance.Never stop capturing your adventures. Canvio Basics offers the space to collect in a size you can take anywhere.The Toshiba Canvio Basics provides a lot of storage so you can store pictures, videos, and your favorite music on a small 2.5" portable drive. Canvio Basics is all you need, wherever you go.Keeping data storage simple, the Canvio Basics lets you collect and store your favorites with its portability and lighting fast transfer speeds. 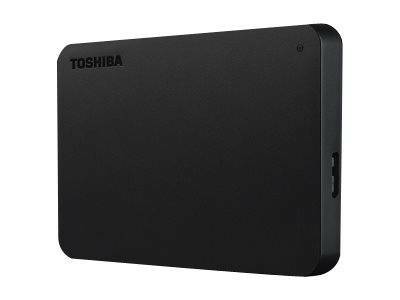 With USB 3.0 you'll be able to transfer files on the go while powering the drive through your laptop's USB connection.The Toshiba Canvio Basics features a minimalist design as well as clean edges, a sleek, matte surface and a thin profile.This durable portable hard drive is built to Toshiba's world-class quality standards.